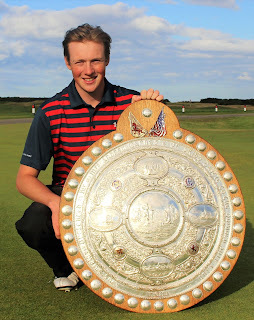 There were no shocks in the first round of the Carnegie Shield at Royal Dornoch but some big impressive scores, the biggest a 9 and 7 win for Norwegian Jorge Paulus who is also a member at Dornoch. The unfortunate visitor at the end of Paulus's sub-par golf was Ian Pether from Dale Hill, East Sussex. Defending champion Banchory's Jack Harling (that's him pictured after his Carnegie Shield triumph 12 months ago) has played little since wintering in New Zealand after completion of his studies in the Dornoch UHI but he was soon into his stride with a third place seeding and ending the progress of Inverness's Four Day winner, David Joel, on the 17th green. Out also went Joel's clubmate Keiran Mackay, winner last week of the Tain Four Day tournament, losing 3 and 2 to three time former winner Andrew Biggadike (USA). Leading qualifier with 67 and 70, also from Inverness, John Forbes cruised into the second round, finishing off Jamie Johnstone (Whittington Head) on the 13th green while the number two qualifier and winner of the Silver Medal, as a Royal Dornoch member, Chris Mailley (70-73) beat Golspie's Billy Melvile after 16 holes. Irishman Garth McGimpsey, who won the Amateur Championship at Royal Dornoch in 1985, is making his third attempt to win the magnificent shield in this its 105th year. McGimpsey won his first game 4 and 3and as fifth seed is a danger to all. J Forbes (Inverness) bt J Johnston (Whittington Heath) 6 and 5. R Evans (Langland Bay) bt G Minton (Royal Dornoch) 3 and 2. R Morrison (USA) bt J Whittle (Appleby) 7 and 6. A McNaughton (Caldwell) bt M McMurray (Moray) 5 and 4. W Short (Peterculter) bt C Unsworth (Mellor and Townescliffe) at 19th. I Rennie (Hindhead) bt G Bethune (Royal Dornoch) 4 and 3. G McGimpsey (Royal Portrush) bt R Skelhon (Hindhead) 4 and 3. F Symon (Tantallon) bt E MacKenzie (Cawder) 1 hole. A Biggadike (USA) bt K MacKay (Inverness) 3 and 2. N McQueen (Stockport) bt T Yick (Richmond) 1 hole. M Macleman (Moray) bt H Andrews (USA) 2 and 1. J Harling (Banchory) bt D Joel (Inverness) 2 and 1. O Dickson((Pennard) bt M Walker((Rothley Park) 3 and 2. J Paulus (Sollered) bt I Pether (Dale Hill) 9 and 7. T Wilkenson (USA) bt B Templeton (Gullane) 4 and 2. C Mailley (Royal Dornoch) bt W Melvile (Golspie) 3 and 2.